Thanks to a reported $1 billion credit line with Chinese manufacturers and a skill for celebrity networking, Africa is being lit up by platinum album selling singer rapper AKON, with solar lighting and other products. Born Aliaune Badara Thiam in St. Louis, and raised in Senegal until he was seven has suggested to local media that he may try to launch an IPO for his New York-based Solektra International solar company. The company is said to have structured some $400 million worth of solar deals to date. Started by Akon back in February 2014, Akon Lighting Africa initiative today has 200,000 small solar projects. Solektra is also active in 14 African countries including: Mali; Niger; Senegal; Guinea; Burkina Faso; Sierra Leone; Benin; Guinea Equatorial; Gabon; Republic of Congo; Namibia; Madagascar; Kenya and Nigeria. The aim of the project is generate partnership with local governments and financial institutions to develop public-private partnerships (PPPs) to finance innovative solar projects, for which panels are supplied by Chinese companies. Nanjing-based power equipment makers Sumec Group and Nari Group are also partners with Solektra. 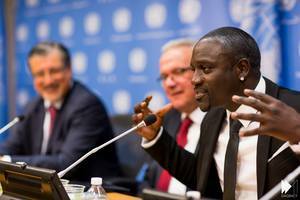 Akon also readily partners with charities and other NGO’s to ensure maximum reach. For example, he has partnered with the Lanyi Foundation and The Healey Foundation, in Sierra Leone. In the offering are a range of solar based lighting, including the Free Light Sol-SL01A, designed to replace traditional oil lamps in rural off-grid areas that have little or no access to electricity. The product comprises a photovoltaic panel, a lithium battery and LED lighting. In addition to providing solar lighting and other products, the focus is also on training workers in solar technology at a school he established in March, in Bamako, Mali. Solektra’s headquarters for Africa are also located in there. France’s Sunna Design also provides some solar lighting products to Solektra, and is collaborating on building a factory in Mali. The company is considering pilot projects in Brazil and India, and has a goal of building a U.S. based solar farm, as well.